7.5 "Living Wage, Jobs for all Act"
Lane A. Evans is a former, far left, Illinois congressman. He served from 1983 to 2007. A native of Rock Island, Evans served in the United States Marine Corps during the Vietnam War, stationed in Okinawa. After leaving the Marines in 1971, Evans enrolled at Augustana College in Rock Island, graduating in 1974. He earned a Juris Doctor degree from Georgetown University in 1978 and began a successful law practice in Rock Island serving children, the poor and working families. In 1982, Evans ran for and won the Democratic nomination for Illinois' 17th District, which included most of Illinois' share of the Quad Cities area. It had been renumbered from the 19th District since Illinois lost two districts after the 1980 census. The district had been in Republican hands for all but two years since 1939. However, the brand of Republicanism that prevailed in the district had traditionally been a moderate one. Evans got a significant boost when 16-year incumbent Tom Railsback was defeated for renomination by a considerably more conservative Republican, State Senator Kenneth McMillan. Taking advantage of hardships from that year's recession, Evans won by just over 5 percentage points. He handily defeated McMillan in a 1984 rematch even in the midst of Ronald Reagan's gigantic landslide victory that year. Evans faced almost no opposition in his next four campaigns, reflecting the growing influence of Moline and Rock Island in what had once been a very rural district. In 1994, however, Evans only won by nine points over an unknown Republican who spent almost no money. This emboldened the Republicans for 1996, when Evans faced Mark Baker, an anchor at WGEM-TV in Quincy (the third-largest city in the district). Even though Bill Clinton carried the district by a healthy 30,000 votes, Evans defeated Baker by only five percentage points. A 1998 rematch was even closer, with Evans only winning by 6,000 votes. A third run by Baker in 2000 saw Evans win by almost 10 points. Redistricting after the 2000 census made Evans much safer. Decatur and part of Springfield were added while some more rural areas were taken out. The redistricting process, guided by House Speaker and 14th District Congressman Dennis Hastert and 3rd District Congressman Bill Lipinski solidified the holdings of many Illinois incumbents. Evans was re-elected in 2002 and 2004 by margins similar to those he scored in the 1980s and early 1990s. Evans' was investigated by the Federal Elections Commission for a conspiracy to violate federal campaign finance laws in both his 1998 and 2000 campaigns that illegally funneled a half million dollars to his campaigns. He agreed to pay a $185,000 fine to the FEC as a result, but the agreement came without an admission of guilt. In the settlement, the FEC noted that personal prosecution of Evans was impossible because the statute of limitations had expired during the 5 year investigation of his complex scheme of illegal campaign funds. Evans has battled Parkinson's Disease since 1995. While his previous opponents, including Baker, didn't make an issue of it, his 2004 opponent, Andrea Zinga (a former anchorwoman at KWQC-TV and WQAD-TV in the Quad Cities) claimed he was not able to fully represent the members of his district due to his health concerns. However, this tactic backfired, and Evans won handily. During his tenure, Evans was one of the most liberal members of the House, and probably Illinois' most liberal congressman from outside Chicago. A founding member of the Congressional Progressive Caucus, he had a near-perfect lifetime rating from Americans for Democratic Action, while the American Conservative Union gave him its lowest rating of any congressman outside Chicago. This would seem to be surprising, given that his district had a strong rural element. However, he had a reputation for strong constituent service. The 17th has a large number of Vietnam veterans who generally accepted his liberal social views due to his support for their interests. The Rock Island Arsenal is a major employer within the district. During his time in office, his support of the Arsenal helped keep it open while cuts were being made nationwide. Lane Evans was very close to Democratic Socialists of America. 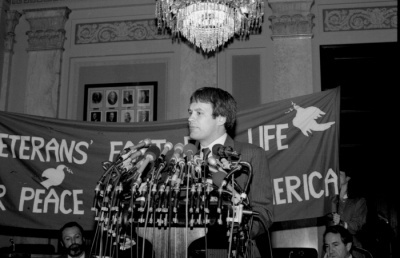 In 1982, Lane Evans was directly supported by Democratic Socialists of America members Monty Tarbox, and Bob Van Meter, in his Congressional campaign. In 1985 Vicky Starr was honored with a Debs-Thomas-Harrington Award at an event that featured fellow Democratic Socialists of America member and then Screen Actors Guild President Ed Asner, and keynote speaker Congressman Lane Evans. In the years since, she remained a faithful patron of the dinner, attending nearly every one. Lane Evans addressed the conference. In July 1996, the Democratic Socialists of America Political Action Committee endorsed Lane Evans, Illinois 7 , in that year's Congressional elections. 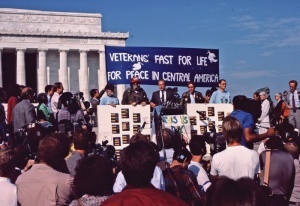 Evans was supported by his own organization in 1998. ON November 16, 1989, Lane Evans served on the Tribute Committee for the Chicago Committee to Defend the Bill of Rights Tribute to Leon Golub and Lucy Montgomery, held at the Congress Hotel, Chicago. The Council for a Livable World, founded in 1962 by long-time socialist activist and alleged Soviet agent, Leo Szilard, is a non-profit advocacy organization that seeks to "reduce the danger of nuclear weapons and increase national security", primarily through supporting progressive, congressional candidates who support their policies. The Council supported Lane Evans in his successful House of Representatives run as candidate for Illinois. In 1997 Congressman Lane Evans served on the board of directors of Citizen Action of Illinois. Signatories included Rep. Lane Evans. In 2003 Rep. Lane Evans served on the Progressive Majority Advisory Committee. In 1998 Lane Evans, Democrat was listed as a member of the Congressional Progressive Caucus. 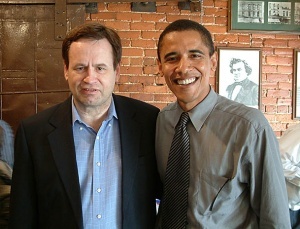 Barack Obama was in 1997 or 98 at a fundraiser for Lane Evans at the home of Marjorie Benton in Evanston. Lane Evans for Congress has been a client of Robert Creamer's Strategic Consulting Group. This page was last modified on 14 February 2018, at 08:03.